An excellent value, full sized six player, adult sized croquet set. 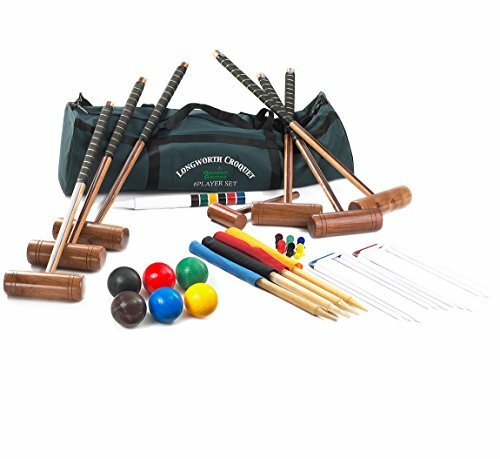 Our Longworth six Player set gives the full complement of croquet equipment and includes 6 high quality,full sized, natural hard wood mallets with leather bound handles, 6 full sized 12 oz wooden croquet balls, steel powder coated hoops, a wooden hoop mallet, corner flags, wooden yard markers, plastic croquet clips, hardwood painted winning post and rules. All packed in a zip fastening nylon bag, with shoulder strap for portability. This is a great set for families and for events and allows more players to get involved without the need for purchasing additional equipment.